bokeh (/ˈboʊkeɪ/ BOH-kay) (Japanese: [boke]) is that aesthetic quality created by the out of focus elements of an image produced by a lens. The term comes from the Japanese word boke (暈け or ボケ), which means “blur” or “haze”, or boke-aji (ボケ味), the “blur quality”. For fairly obvious reasons, most serious camera owners would try and get a ‘good’ bokeh in their shallow depth-of-field images as the quality of the out-of-focus background would dramatically lift the viewers focus on the subject. So, one of the ingredients of a ‘pleasing’ background bokeh is a shallow depth-of-field. Now, I am sure all of you would be aware that there are several factors that affect the depth-of-field – the subject, the distance of the camera to the subject, the lens focal length and the f-number selected – so I won’t get into the technicalities of that here. An oft forgotten ingredient is the distance of the subject from what would constitute the background of the frame/image. Typically, when one is in a forest and taking pictures of birds, some of these factors are quite out of ones’ control. When one does get an opportunity and these elements fall in place fortuitously, it is important to be aware of the situation and try and take advantage of it. We were on our way back from Zuluk and, as happened quite often during the trip, it was pouring non-stop, the accompanying mist adversely impacted visibility and all that we could do was to squint and stare out into the passing foliage and see if there was any interesting bird that we could spot. As we passed Phadamchen, there was a momentary let-up in the downpour and the mists magically lifted as if someone had pulled the veil off. Through the rain-drenched forest and against the sunlight we spotted a Streaked Spiderhunter perched on top of a barren tree-top. 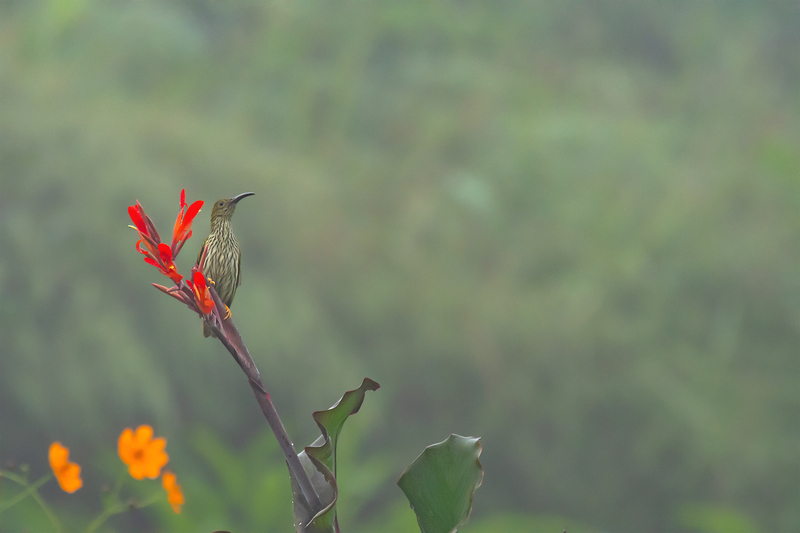 Just as we stopped, the bird decided to fly over us and take position on a lovely, red flower. As I clicked a few shots, I realised that I could walk around to a spot where the forest in the background would create a lovely green blur that would enhance the frame. I repositioned myself and clicked a few more shots and, now, I noticed bits of an ochre-coloured flower at the bottom left corner of the frame – it seemed to be adding an unexpected dash of colour and some oomph to the image, atleast thats what I thought at that time. So I incorporated three of these flowers in this final shot. I think that they definitely enhance the feel of a rather green-hued monochromatic frame, don’t you think?